With a video security solution from Dallmeier, Your Homes Newcastle (YHN) was able to lower the crime rate for the tenants in more than 65 buildings. At the same time, consolidation and centralisation of the systems allowed YHN to significantly reduce cost and complexity of the heterogeneous legacy solution. YHN is an Arms Length Management Organisation (ALMO) responsible for managing 26 700 council homes on behalf of Newcastle City Council and over 400 homes on behalf of Leazes Homes in Newcastle, England. YHN´s mission is to provide high performing, innovative and focused quality housing management and support services. 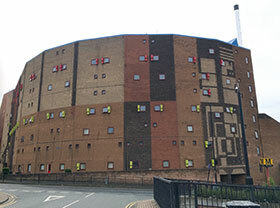 Within one of the largest security projects in 2012, valued at over £8m, YHN contracted integrator Openview to provide an integrated security system solution which protected the majority of the public housing stock in the city of Newcastle upon Tyne, a total of 65 buildings serving over 4700 dwellings. The project comprised door entry intercoms with fire and intruder alarm integration, access control, alarm management, full structured cabling CAT6 infrastructure and associated building works, as well as a complete revamp of the associated video surveillance system. “For many years YHN/Newcastle Council used a mix of various standalone CCTV systems within the many properties it managed. The systems were not well maintained. They were beginning to fail and were unable to provide suitable image quality. Since the systems were all standalone, they were all monitored locally by 24-hour security/concierge at high cost and complexity,” says Steven Studley, technical surveyor for YHN. Dallmeier was approached by lead consultants Ove Arup to engage in a feasibility study as to how the systems could be upgraded to provide a higher quality and more resilient solution that was centrally managed in YHN’s HQ, located in South Gosforth. After Dallmeier had been awarded with the contract, the project started early in 2013 with a roll out plan to have the project completed late 2016. The solution consists of more than 700 cameras. Dallmeier delivered mainly HD IP cameras in various designs and supporting PTZ dome cameras. For recording, predominantly the Dallmeier dual channel blade recording solution was implemented. “During the initial discussions with the customer and consultant, it was made clear to us that the recording solution needed to be extremely resilient and reliable. This is the reason we presented a blade recording solution,” says Jason Piggott, Dallmeier UK sales manager. For the video management, Dallmeier´s SeMSy system was fully integrated with the customer’s management system. With 13 operator positions and monitor walls, SeMSy is a high-performance and future-proof video management system with optimum user friendliness. It offers a comprehensive range of functions, including the display of live images, various search options within the footage or the control of DDZ functional cameras with easy archiving of relevant sequences. The SeMSy system is completely scalable to integrate additional components. “We are already in discussions with various stake holders at other locations within the city of Newcastle where the system could be expanded to,” says Studley. Due to the complexity of the project, smooth deployment was a key criterion for Openview. The entire system arrived at the installation site preconfigured by Dallmeier allowing true plug-and-play installation by Openview. The security operators received thorough training after commissioning. The project has been ongoing since it started in early 2013 and was completed at the beginning of 2017. During the four years, sites were added and new products and software versions deployed. The system has demonstrated its scalability and backwards compatibility with all the components. “The feedback thus far from the police and other stake holders has been extremely positive. The quality of the images far exceeds anything the police had received from us in the past and has given them the tools to investigate crime and pursue prosecutions. There has been a renewed sense of belief in the system from the police now they have gained confidence in the evidence it provides,” says Studley. “With the ability to now identify many of those in the images and take actions where necessary, we have been able to improve the lives of our tenants and by ensuring that word gets about regarding the systems success, have managed to reduce crime in and around our properties,” he continues.